ROCHESTER – Linus Ullmark struggled to answer the question. The goalie paused for a moment and fought back tears following what could be his last AHL appearance. Talk to any member of the upstart Americans, and they’ll likely tell you how a great group of guys helped buoy them to their first playoff appearance since 2014. So when Ullmark, 24, tried talking about what made the team so special following Wednesday’s season-ending 6-3 loss, he became choked up. “It’s been fun, it’s been real fun,” an emotional Ullmark said of the season after the Syracuse Crunch swept the Amerks in the best-of-five first-round series. Ullmark, of course, will almost certainly graduate to the parent Buffalo Sabres next season. This year, the Swede’s third in North America, he became the Amerks’ backbone and MVP. Leaving a group he loves, especially after losing three straight games, is tough. Still, he can graduate to the NHL knowing he helped make the Amerks, a proud team that struggled for three seasons, relevant again. “We had a plan to start off in the summer to make the playoffs,” Amerks coach Chris Taylor said. But none of the Sabres’ top prospects had ever played in an AHL playoff game. 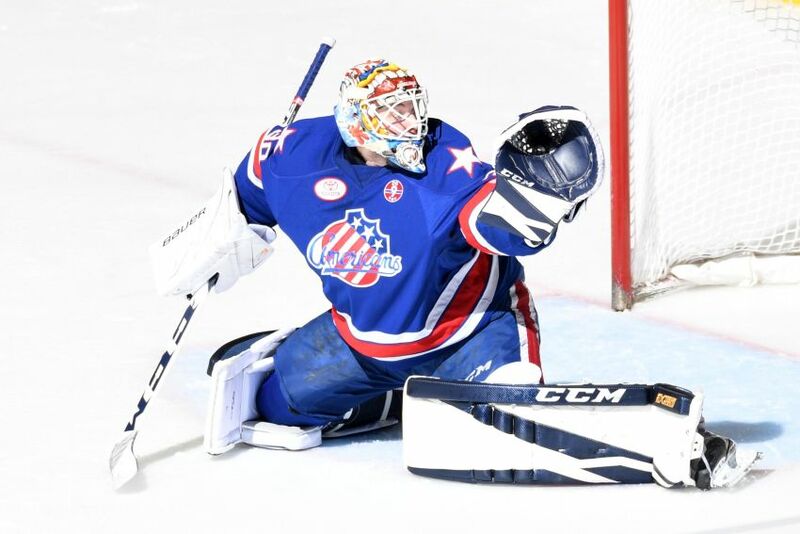 The Amerks struggled against the Crunch, one of the league’s heavyweights, losing the first two games in Syracuse 6-2 and 6-5. “When you’re in the playoffs, it’s a different level, and we didn’t bring that next level,” Taylor said. “And it’s tough, because we have … 10 or 11 guys that it’s the first time playing in the playoffs. The Amerks had it for brief stretches Wednesday before imploding before the crowd of 6,145 enjoying the first playoff game at Blue Cross Arena since April 26, 2014. After winger Justin Bailey put the Amerks up 2-1 7:48 into the second period, the Crunch scored twice in just 19 seconds. Defenseman Cal Foote answered 29 seconds after Bailey scored, then winger Olivier Archambault followed, giving the Crunch its first lead. Center Mitchell Stephens extended the lead at 10:49. The Amerks struggled for three games in front of Ullmark, who allowed 16 goals during the series. Bailey left the game late holding his left arm after Crunch defenseman Daniel Westcott hit him. Taylor had no update on the Williamsville native.